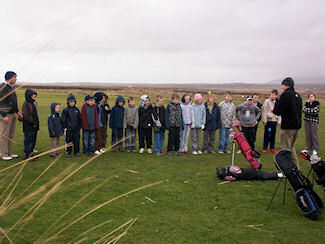 Supported by the Islay Golf Club members who have trained to become volunteer level 1 coaches Ron kicked off the lessons last Sunday. As you can see from the pictures it was a grey and cold March day (the previous day had been like summer...), but at least it remained dry. 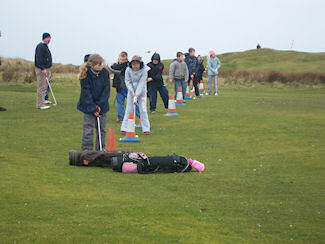 The 20 children who turned up very much enjoyed the day, mainly practising putting and chipping. This was the first lesson of a six week course, the first of its kind at the club. In addition to the junior courses Ron also offers other services including golf tuition, club repairs and Islay Golf Club clothing. Over the winter he has mainly been teaching local Islay residents, but now that the tourist season is kicking off he's also coaching visitors to The Machrie. 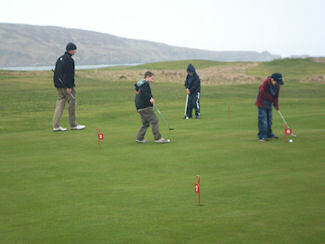 Hopefully Ron will be able to send further updates about golf on Islay and at The Machrie. Watch this space, for previous entries try the Golf at the Machrie collection.